For cancer survivors, cancer’s return can be a sudden, agonizing punch to the gut. And that’s especially true for patients whose cancer develops in the same area where the first cancer had been successfully treated with radiation. Physicians have a harder time using photon treatments a second time. They don’t want inadvertent radiation to re-injure adjacent tissues and organs — over and above the unintentional radiation experienced during photon treatments for the first cancer. And if chemotherapy and surgery are poor treatment options, surviving the second cancer is more challenging. But targeted proton beams offer an alternative radiation option that may increase the odds of surviving these locally recurring cancers and local secondary cancers. 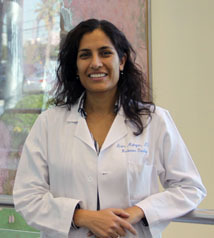 Protons can provide effective cancer-killing power, with less collateral damage to adjacent tissues and organs, particularly those that have already been affected by inadvertent radiation during the first cancer treatment, said Anita Mahajan, MD, medical director of the MD Anderson Proton Therapy Center in Houston, Texas. “Protons are very strategic that way,” she said. Mahajan said she currently has four “re-radiation patients” receiving treatment at MD Anderson. Some were treated with photon radiation therapy 15 or 20 years ago and recently developed a second cancer in the same area. Mahajan cautioned not to presume that all local secondary cancers or locally recurring cancers are caused by photon radiation.